Christmas and squirrels together? You wouldn’t think so, until you see these humorous greeting cards. Squirrels in funny poses, doing funny acts and saying funny things. Christmas and squirrels go nicely together. Squirrels are a big part of my yard during the winter and they certainly have their place around Christmas time, just like any other animal that shares the outdoor space with me. When I found these funny holiday greeting cards, I couldn’t resist. The little squirrels are just too cute and what they do and say brings more humor at a time when it’s always welcome. As far as I’m concerned, you just can’t get enough humor in your life. When it comes to the holidays and all the stress around getting the decorations up, the cards sent out, the gifts bought, wrapped and shipped, not to mention the cooking and baking, a little humor break is always welcome. Every year I send out funny Christmas cards. Friends and family tell me how much they look forward to what laugh they will get from my cards. That’s a humor break that I love giving. If you want more funny cards, check out Funny Retro Christmas Cards and Funny Reindeer Cards. All my greeting cards come from Zazzle.com, and that’s for a very good reason. Well, lots of reasons actually. When you put together all these factors, and more, you get a truly wonderful place to order your own greeting cards online. No searching the stores for something that is only acceptable. No long hours of signing a bunch of cards. And no hassles. I think that’s my favorite part. 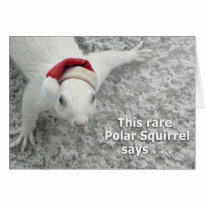 So go ahead and chose your favorite funny squirrel Christmas card. Then get ready for all the compliments you get this year. 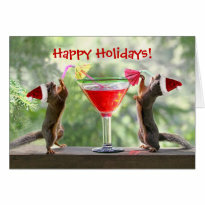 I love funny cards and I certainly love squirrels so the two together are definitely a hit in my book. I really do think it is great that we can order just the number needed. I have always hated having just a few cards left over. I can’t seem to force myself to throw them away, so I end up having a huge collection of leftover Christmas cards. 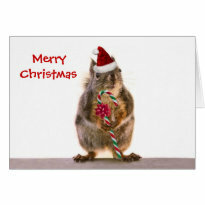 These squirrel Christmas cards are great! I do know I enjoy opening the mail around the holidays and funny cards are my favorite! It’s a break from the stress of the season!